That which is unsustainable will pass away and be replaced with a more sustainable arrangement. That is the crisis and the opportunity. "Never let a crisis go to waste" need not be the exclusive agenda of the Power Elite/ parasitic Aristocracy: it could be the agenda for the rest of us, i.e. the debt-serfs. If you are unfamiliar with the neofeudal/neocolonial financialization model, please read The E.U., Neofeudalism and the Neocolonial-Financialization Model (May 24, 2012). The same dynamics apply to the American Empire and domestic economy. Before we begin, please glance at the following six charts: To cut to the heart of the matter, always ask: cui bono--to whose benefit? The charts reveal the answer. 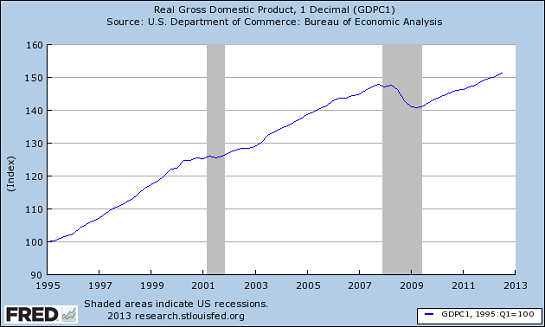 Can you say "exponential" and "unsustainable"? 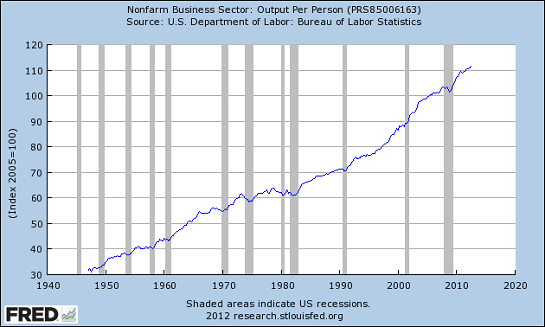 Productivity per worker keeps increasing--where is the net going? As I have endeavored to explain this week, this financialization of the economy is the direct result of Federal Reserve and Federal government policies. 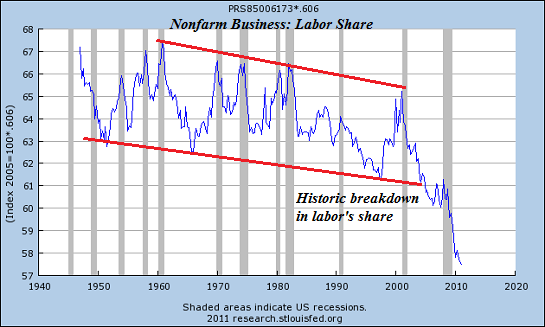 The fact that gains in productivity are not flowing to wage earners is not some mysterious warp of space-time--it is the direct consequence of the Fed's financialization of the economy, supported by the political Elites of Federal government. In the neofeudal, neocolonial model, speculation by the parasitic Aristocracy is backstopped by the taxpayers--the perfection of moral hazard. Debt (that profits the parasitic financial Aristocracy) is heavily incentivized while saving capital (cash) is punished with negative yields. There are no financial limits on State borrowing and spending when the Federal Reserve is monetizing Treasury debt. The Federal government is thus free to borrow and squander trillions of dollars supporting cartels (sickcare, national security, war-on-drugs gulags, higher education, etc.) and pass the interest costs on to taxpayers, present and future. There are also no limits on the skim of the financial Aristocracy when the Fed gives them unlimited 0% money, backstops their gambling and destroys the incentives to accumulate cash capital and invest it productively rather than speculatively. This is the essence of the neocolonial model: make money cheap, reward consumption and speculation in asset bubbles and draw once-prudent citizens into debt-serfdom. Those not ready for big-mortgage serfdom are snared with the $100,000 student loan skim. This neocolonial model leads to neofeudalism: Oops, the asset bubble burst, so your (phantom) wealth has vanished, but you still owe us the debt. Funny how that works. In an economy based on debt, servicing that debt absorbs much of the income. So you need to borrow more to get by. Each degree will rack up $100,000 in debt, and if you can't get a job, then the "solution" is another degree--oh, and of course, another hundred thou in debt. There are no limits on Central State and financial Aristocracy exploitation, but there are limits on what debt-serfs can pay. 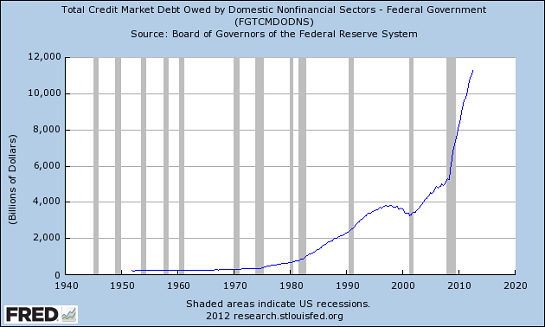 Since we can't print money, there are limits for us debt-serfs. 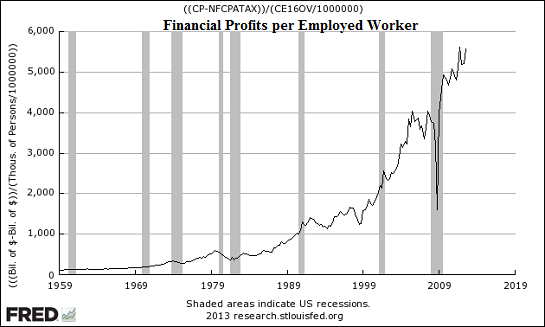 There are also limits on how much we can extract from a neocolonial/neofeudal system as wages (see above charts). This neocolonial/neofeudal financialization model will implode under its own weight, and that will be the crisis. The opportunity will be to renounce all the unpayable debt and resolve to establish a radically lower-cost way of life that doesn't need "high incomes" for a fulfilling, prosperous life. Such a way of life is based not on an extractive, expansive State or its partner, the exploitative parasitic Aristocracy, but on the forgotten third foundation of the economy, the community. I cover this in my books Why Things Are Falling Apart and What We Can Do About It andResistance, Revolution, Liberation: A Model for Positive Change. Thank you, Steven K. ($75), for your monumentally generous contribution to this site -- I am greatly honored by your support and readership. Thank you, Walter J. ($50), for your stupendously generous contribution to this site --I am greatly honored by your support and readership.